We had close to 150 people throughout the day, and there were more than 75 gathered in the center of the space for the ritual Frederic and Mary Ann asked me to create for the three occasions. I borrowed elements from previous rituals I’ve written about here. See which ones you recognize. On behalf of Frederic, Mary Ann, Patricia, and myself, I want to welcome you and thank you for coming to The Center for Spirituality & Practice. There is much to celebrate today, specifically these three things: the first day of spring, the 10th anniversary of our website SpiritualityandPractice.com, and the opening and blessing of the new Center for Spirituality & Practice. And so our ritual will honor threes. Threes invite unlimited perspectives and possibilities. Threes also show us that we are not separate from the rest of the universe but are literally braided into it. We have three containers here which I will talk about more in a few moments. There will also be three sections to our ritual: We will begin by welcoming Spring. Then we will move into a Water Ritual celebrating the website's birthday. And finally, we will tie everything together with gratitude when we will invite your blessings and affirmations for the future of The Center. "Spring is a season of renewal and rebirth. It's a time when buds become leaves and flowers, when healing rain washes city streets and falls like grace on parched country fields, when the hard ground beneath us softens to allow shoots of new life to emerge. "As outside, so inside. Spring is a time for cleaning out and making way for fresh possibilities and new commitments. It's a time to revive our senses and expand our horizons. It's a time to begin again." If you feel comfortable doing so, please close your eyes. Let's all take a few moments to take three conscious deep breaths to become grounded and centered in this space and our own being. Please keep your eyes closed as Patricia reads this poem by e. e. cummings. now the eyes of my eyes are opened)"
Take a moment to reflect on what spring means to you. Let's bring our focus now to these 2 bowls and vase. They collectively and individually represent the past, present, and future of Spirituality & Practice. To begin Patricia and I will pour more water into the two bowls. Water is used throughout the world in ritual and ceremony: from the pouring of libations in the Yoruba tradition of Africa to baptisms in the Christian faith, from handwashing (netilat yadayim) in Judaism to the three ablutions of Islam. And the list goes on and on it goes weaving through all the traditions, cultures, and paths of the world. Water is powerful and cleansing, representing fresh possibilities and clarity. And so as Patricia and I pour the water into these bowls, imagine it washing over you and this space. Let it clear and cleanse what doesn’t serve and nourish that which we want to flourish. Mary Ann and Frederic please come forward. We have three candles of Mary Ann's favorite flower – the hibiscus – because the short life of each bloom reminds us to be present in every moment. These candles also symbolize outward expressions of joy and happiness. And more deeply, a hibiscus represents a dream realized, of enjoying every step of the way, seeing beauty and recognizing the sacred all around us. So, Mary Ann and Frederic, in honor of S&P's 10th birthday we ask you to light these candles, instead of blowing them out as is traditional. These lights represent all the amazing effort and energy that you have lovingly poured into this website and which we hope continues to burn brightly for many years to come. 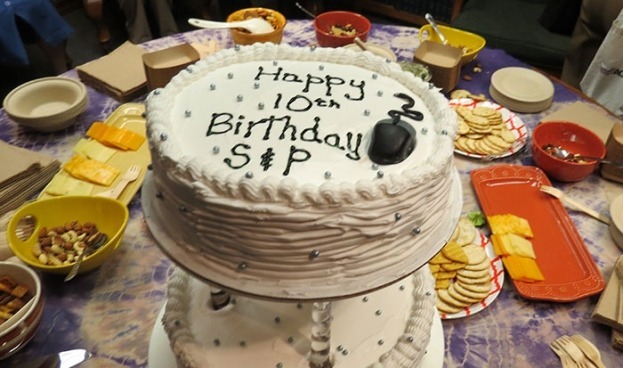 As they light their candles, let's all sing Happy Birthday S&P! As I mentioned earlier, these three containers collectively and individually represent the past, present, and future. And in this final section of our ritual today, we invite you to more fully participate. First we would like to offer our gratitude to the many people who helped make this all possible, including our Founding Practicing Partners as well as volunteers and friends. Now you can offer gratitude for what has already been done in the 10 years of Spirituality & Practice, offer blessings for the new Center, and/or offer affirmations and wishes for its future. This can all be done silently by lighting one of the white candles lined up beside the water bowls from Frederic and Mary Ann's candles and placing it in one of the bowls. Or you can choose to write out your blessing, gratitude, or affirmation on one of the slips of paper scattered around on the table. You can then place it in this beautiful vase which will remain here at The Center for Spirituality & Practice and be a visible reminder of this day and of all the good wishes and blessings of those who are here today. And more so, if Frederic and Mary Ann, and any others working here in the future, are having a really bad day, they can pull a slip out and read your offering for encouragement! While the music plays, please come forward when you feel called and light a candle and/or write your blessing. The candles and paper slips will be available after the ritual for the rest of the day, so if you want to take your time and wait for inspiration, you may do so. Again, the paper will be available the rest of the evening so please don't feel rushed. And now to close our ritual, Mary Ann will offer a prayer she and Frederic have written. help us to be open to change. called to this kind of service. new adventures in the coming years. Dear Mary Ann & Frederic, Darren & Patricia, Thank you for sharing your 10th Anniversary Celebration! Living in Northern California, I was not able to join you, though my spirit was and is with you and your work. It has been a good and grateful five years for me since finding you and your work! I look forward to continued sharing, praying and preparing ourselves for our journey forward. Congratulations! And welcome to Claremont and California! This was a moving and meaningful ceremony even as one far away and many days later can be transported to those moments. Having shared a little bit in this ministry over the many decades, I feel the energy continuing and adapting to the new environment even as it did for the cultural and artistic changes throughout the years. I am blessed to be among all of you. I give thanks for all that is before us. I send blessings for the new location for S & P. I know it is a beautiful locations since I once lived close to that area. I have not been a participant since it's inception but I thank God each time I read, listen or participate in the offerings. You all always have something that speaks to me in some form. And I bless you and thank you.